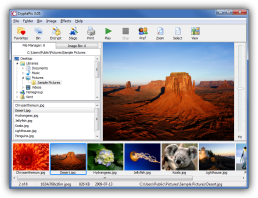 CryptaPix ™ is an image file management and encryption program for Windows. 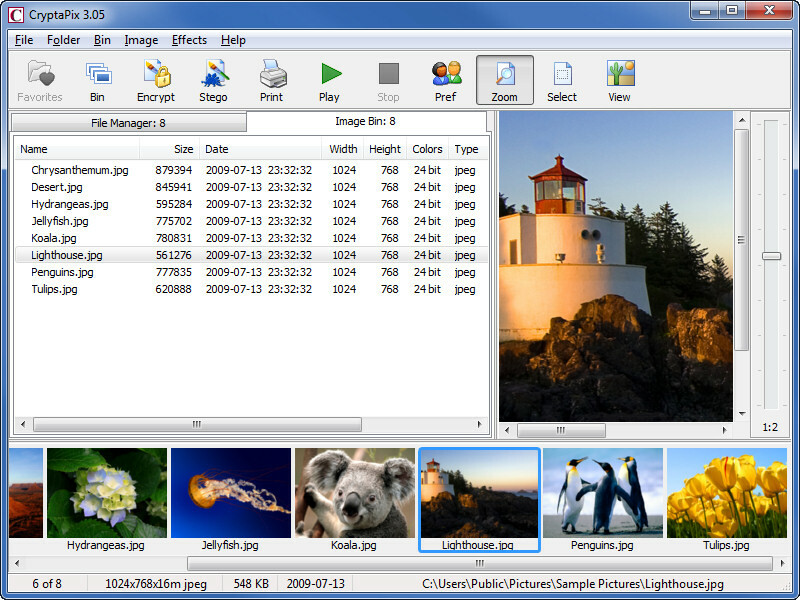 Organize, print and secure your digital photos and downloaded image files. Resize, rotate, crop, and remove red-eye from photographs. Create standalone slideshows to send to your friends. Secure your proprietary images from unauthorized access with 256-bit AES encryption or hide sensitive text, data, or other images into an image with the secure steganography feature. Read support for these formats: BAY, BMP, CRW, CR2, CUR, DCR, DCX, DIB, EMF, FAX, GIF, G3F, G3N, ICB, ICO, JIF, JPC, JPE, JPG, JP2, J2C, J2K, MRW, NEF, ORF, PBM, PCX, PEF, PGM, PIX, PNG, PPM, PSD, PXM, RAF, RAW, RLE, SRF, TGA, TIF, VDA, VST, WBMP, WMF, XIF, X3F. Multi-frame read support for ICO, DCX, TIF, and animated GIF images. 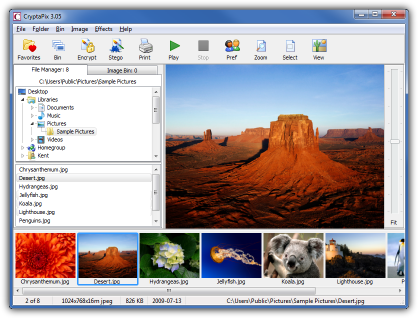 Write support for BMP, JPG, JP2, PCX, PNG, TGA, and single-frame GIF and TIF image types. Automated thumbnail browsing and 64-level image zooming. Rotate to any angle and resize with various resampling filters. Lossless JPEG rotation, flipping, and mirroring. Adjust brightness, contract, hue, saturation, luminosity, color, tint, gamma correction, sharpen, blur, red eye, grayscale, and negative. Import images from scanners and other twain-compliant devices. Copy, move, clone, and rename (with serialization option). Secure image deletion, up to 35 wipe passes. Image encryption with secure 256-bit AES algorithm. 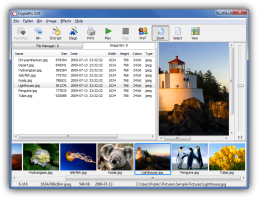 Image steganography (hides text, data, and other images inside an image). Standalone slideshows (exe format) with encryption and wav audio options. Exe format (cpx32.exe, 2.3 MB). Download and run to start the installation. 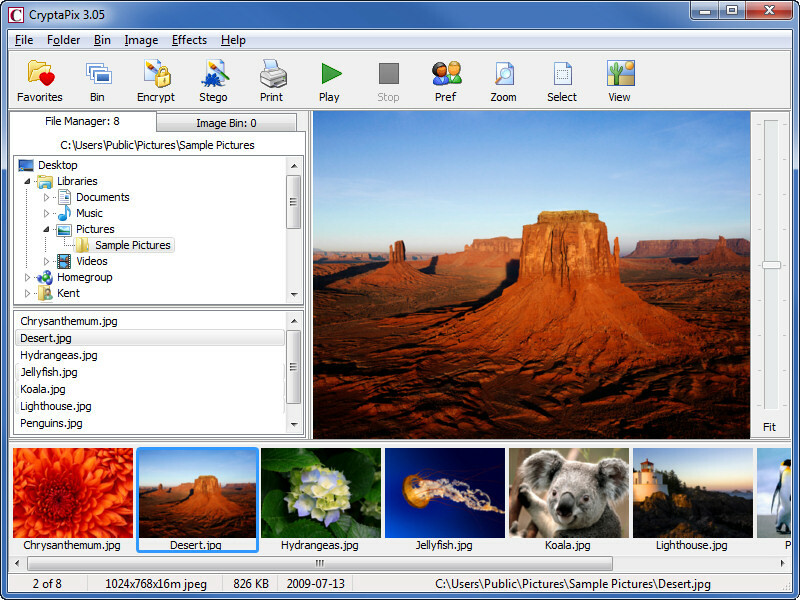 Zip format (cpx32310.zip, 2.3 MB). Setup file wrapped in a zip file. Order the full licensed version of CryptaPix for $34.95 from the Order Form page. Multi-user site licenses are also available. Version 1 and 2 license holders can contact Kent Briggs for instructions on how to upgrade to version 3 at 50% off the regular price. Frequently Asked Questions - A FAQ file for CryptaPix is available here.